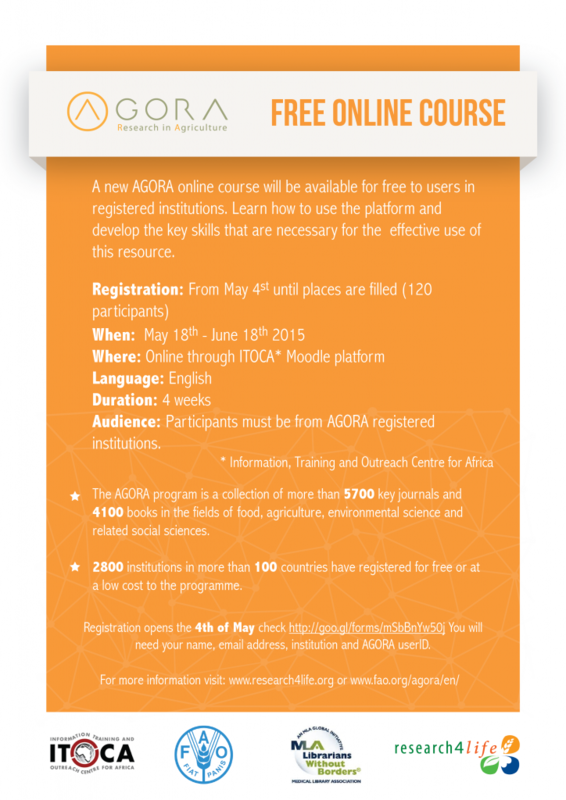 If you are a researcher, librarian or a professional working in Agriculture, the new AGORA online course is for you. Delivered online through the ITOCA Moodle platform, the course takes around 6-8 hours to complete, is self-paced and contains a short set of exercises to complete. You will learn key skills that are necessary for the efficient and effective use of the resources in the Programme. Participants will receive a certificate after finishing the course. The AGORA programme is a collection of more than 5700 key journals and 4100 books in the fields of food, agriculture, environmental science and related social sciences. 2800 institutions in more than 100 countries have registered for free or at a low cost to the programme. In order to join you must be from an AGORA registered institution. Registration opens the 4th of May following this online form. You will need your name, email address, institution and AGORA userID.